A 42 mm objective binocular can gather more light, but it won't necessarily look any brighter than a 32 mm. Here's why. If you hold your binocular away from your eyes and point it at a window or other light source, you'll see a small, bright circle in the center of each eyepiece. That's the exit pupil, the column of light coming out of the binocular. A smaller objective lens (say 32mm) makes a smaller exit pupil than does a larger objective lens (say 42mm). But in ordinary daylight conditions, your eye's pupil contracts and may be smaller than the binocular's exit pupil. Much of the light column does not enter the eye and thus cannot contribute to the brightness of the image. You pay more for the larger, 42 mm binocular, but as far as brightness is concerned, it's just extra weight. Larger binoculars might be brighter when it's very dark, but only if your eye's pupil can dilate larger than the binocular's exit pupil. Because as we age the pupil of the eye loses some of its ability to dilate, somewhere in mid-life you may find that you don't gain anything from carrying a full-sized binocular, even at dusk. You may see just as well with a mid-size model. A legitimate concern with a smaller exit pupil binocular is that it takes more precision to position it exactly in front of your pupils. Full-sized binoculars are more forgiving because of their larger exit pupils. They'll be easier to use on a boat, or by a person whose hands are unsteady. Other than that, mid-sized binoculars may be an ideal choice. 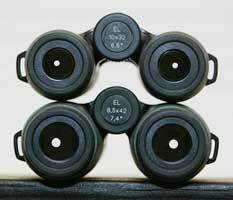 Another advantage of mid-sized binoculars is that 8x32s often have a wider field of view than the 8x42 version of the same model. For example, a Zeiss Victory 8x42 FL has a 405-foot field of view. The 8x32 has 420. A wider field of view makes it easier to spot a bird and provides a more immersive, big-picture experience.